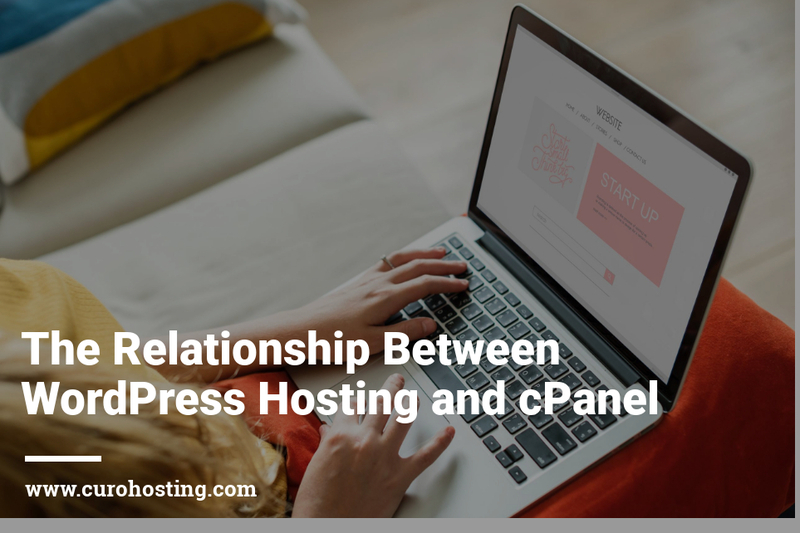 When searching for a new web host you will see that most hosting packages list a cPanel license as a feature but many WordPress users are unsure what this means and how it benefits them. cPanel and WordPress hosting packages go hand in hand but what is cPanel and why is it necessary in WordPress hosting? cPanel is a web-based control panel where users can manage all elements of their hosting account. The cPanel dashboard makes it easier for WordPress users to manage their hosting without vast technological knowledge. It includes features such as email and FTP accounts as well as databases, domain settings and metrics. cPanel was designed to allow non-technical users to manage all aspects of their hosting without the need for advanced skills. It comes as standard with most web hosting packages as it enables users to make hosting a website simple. Users require a license for cPanel, but with no limit on the number of users to a license, web hosts are able to offer a cPanel license as part of your hosting package. One of the most utilised features of the control panel is email configuration. Users can access everything to do with their emails that they need through cPanel. Users are able to create email accounts connected to their domain name in cPanel as well as create email forwarders and auto-responders. Users can also change their email passwords through cPanel. cPanel also includes a helpful feature called “webmail”. Webmail allows users to view their domain emails from within; this means that users don’t have to worry about details such as host names and port numbers as you can log in to cPanel on any device and access your email accounts. SSL is an essential element of any site. If you are planning to use an un-serviced SSL certificate, then cPanel is the place install and configure an SSL certficate. 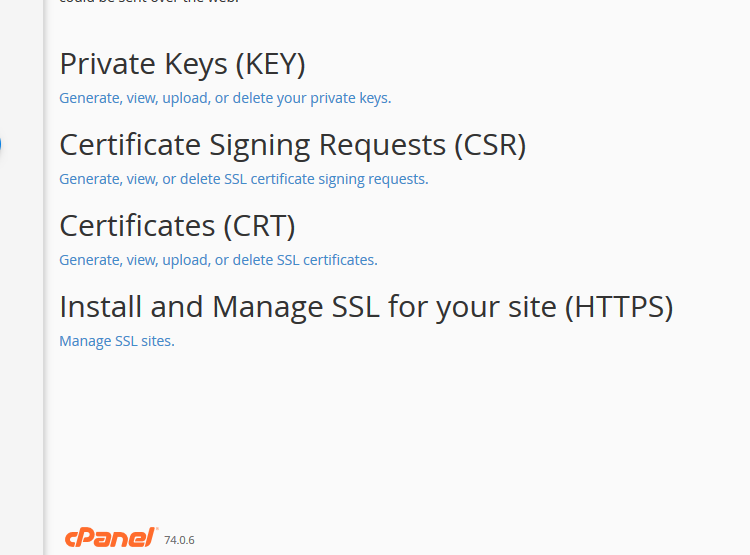 cPanel allows you to generate a certificate signing request (CSR) as well as view, create, upload or delete private keys and certificates. You can also install and manage your SSL certificate(s) in one central place. Taking backups of your WordPress site is essential whether it is to get your site back on track after a hack or to revert back to a previous design. After all, you would save your Word document as you worked on it and backups of your site are no different. 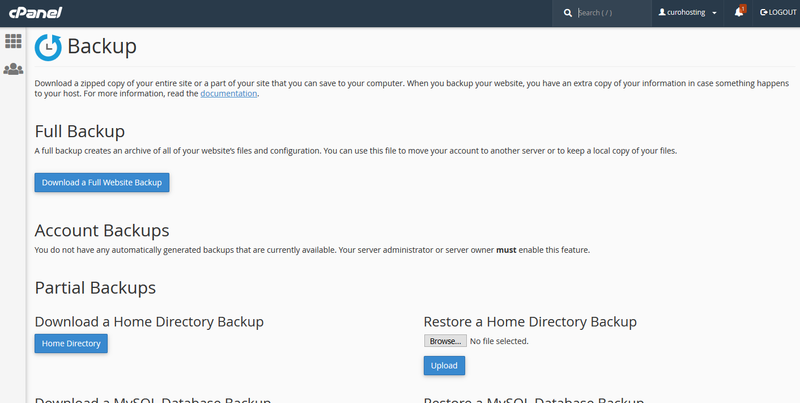 Taking a backup is easy in cPanel as you can download a full website backup with the click of a button. There are also domain features within cPanel. You can create add-on domains and subdomains as well as advanced DNS features like the domains MX records. Furthermore, it allows you to add parked domains which can be used to redirect one domain to another which is a feature that often comes in handy for even the most beginner cPanel users. cPanel also allows you to monitor specific statistics like disk usage as well as bandwidth, raw access logs and error logs. A helpful feature for WordPress users is from Softaculous within cPanel; this allows one-click installs of a variety of things including WordPress itself. CuroHosting have simplified cPanel even more! cPanel, as shown in this article, has a host of helpful features. CuroHosting has made cPanel extremely easy to access and use! Our new WordPress management app- CuroHub-offers a direct link to cPanel. CuroHub shows all of the most popular features in cPanel in an overview of your site as well as our hosting features. If you would like to try out cPanel via the CuroHub you can partake in a 14 day trial at absolutely no cost. You can choose from three Managed WordPress Hosting packages that all offer cPanel in one easy to use app.